1 Also 080 from Malaysia. Brunei, officially the Sultanate of Brunei ( Malay: Negara Brunei Darussalam, Arabic: سلطنة بروناي‎, Jawi: برني دارالسلام), is a country located on the island of Borneo, in Southeast Asia. Apart from its coastline with the South China Sea, it is completely surrounded by the state of Sarawak, East Malaysia. Brunei, the remnant of a very powerful sultanate, became independent from Great Britain in 1984. The Sultanate of Brunei was very powerful from the 14th through the 16th century. Its realm covered the whole island of Borneo and the southern Philippines. European influence gradually brought an end to this regional power. Later, there was a brief war with Spain, in which Brunei was victorious. The decline of the Bruneian Empire culminated in the 19th century when Brunei lost much of its territory to the White Rajahs of Sarawak, resulting in its current small landmass and separation into two parts. Brunei was a British protectorate from 1888 to 1984. There was a small rebellion against the monarchy during the 1960s, which was prevented by the United Kingdom. This event became known as the Brunei Revolt and was partly responsible for the failure to create the North Borneo Federation. The rebellion also affected Brunei's decision to opt out of the Malaysian Federation and was the first stage of the Indonesia-Malaysia confrontation. 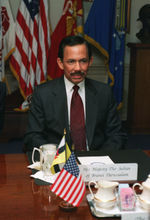 Sultan Hassanal Bolkiah of Brunei, whose title has passed within the same dynasty since the 15th century, is the head of state and head of government in Brunei. The Sultan is advised by several councils and a cabinet of ministers although he is effectively the supreme ruler. The media is extremely pro-government and the Royal family retains a venerated status within the country. There is no elected legislative body. In September 2004, the Sultan convened an appointed Parliament which had not met since independence in 1984, although it lacks any capacity beyond advising the monarch. Due to the absolute rule of the Sultan, Brunei is one of the most politically stable countries in Asia. The country has been under hypothetical martial law since a rebellion occurred in the early 1960s and was put down by British troops from Singapore. Brunei claims territory in Sarawak, such as Limbang, and is one of many nations to lay claim to the disputed Spratly Islands. Several small islands situated between Brunei and Labuan, including Kuraman island, are contested between Brunei and Malaysia. However, they are internationally recognised as part of the latter. The districts are sub-divided into 38 mukims. Brunei consists of two unconnected parts; 97% of the population lives in the larger western part, only about 10,000 live in the mountainous eastern part, the district of Temburong. The total population of Brunei is 383,000 and out of that number about 46,000 people live in the capital Bandar Seri Begawan. Some major towns are the capital Bandar, the port town Muara, the oil producing town of Seria and its neighboring town, Kuala Belait (K.B). In the Belait district, the Panaga area is home to large numbers of expatriates due to Royal Dutch Shell and British Army housing and recreational facilities. The well-known Panaga Club is situated here. The climate in Brunei is equatorial Tropical climate tropical, with high temperatures, a high humidity , sunshine and heavy rainfall throughout the year. This small, wealthy economy is a mixture of foreign and domestic entrepreneurship, government regulation, welfare measures, and village tradition. Crude oil and natural gas production account for nearly half of GDP. Substantial income from overseas investment supplements income from domestic production. The government provides for all medical services and subsidizes rice and housing. Brunei's leaders are concerned that steadily increased integration in the world economy will undermine internal social cohesion although it became a more prominent player by serving as chairman for the 2000 APEC (Asian Pacific Economic Cooperation) forum. Stated plans for the future include upgrading the labour force, reducing unemployment, strengthening the banking and tourist sectors, and, in general, further widening the economic base. The national airline, Royal Brunei is trying to make Brunei a hub for international travel between Europe and Australia/New Zealand. It also has services to major Asian destinations. About two-thirds of the Brunei population are of Malay origin. The most important ethnic minority group who dominated the nation's economy are the Chinese, with about 15%. These groups also reflect the most important languages: Malay (Malay: Bahasa Melayu), which is the official language, and Chinese. English is also widely spoken and there is a relatively large expatriate community with large numbers of British and Australian citizens. Islam is the official religion of Brunei, and the sultan is the head of the religion in the country. Other faiths practised are Buddhism (mainly by the Chinese), Christianity and (in very small communities) indigenous religions. The culture of Brunei is predominantly Malay, with heavy influences from Hinduism and Islam, but is seen as more conservative than Malaysia. The sale and public consumption of alcohol is banned, with foreigners and non-Muslims allowed to bring in 12 cans of beer and two bottles of spirits every time they enter the country. After the introduction of prohibition in the early 1990's, all pubs and nightclubs were forced to close.